ab35988 is reactive with the beta chain of the V. cholerae toxin. Our Abpromise guarantee covers the use of ab35988 in the following tested applications. 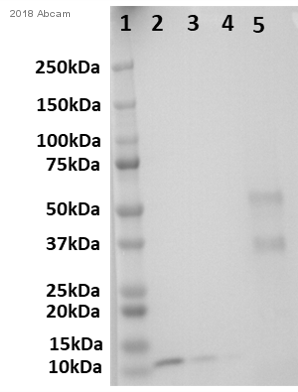 IHC (PFA fixed) Use at an assay dependent concentration. Publishing research using ab35988? Please let us know so that we can cite the reference in this datasheet. Thank you for your enquiry. Our antibody to Beta Subunit Cholera Toxin (ab34992) should recognize the beta subunit in both monomeric and pentameric　forms. I hope this information helps, please do not hesitate to contact us if you need any more advice or information. Thank you for your enquiry. Our antibody to Beta Subunit Cholera Toxin (ab35988) should recognize the beta subunit in both monomeric and pentameric　forms. I hope this information helps, please do not hesitate to contact us if you need any more advice or information.